The southern rim of Argyre Planitia crater on Mars. Cosmic impacts that once bombed Mars might have sent temperatures skyrocketing on the Red Planet in ancient times, enough to set warming of the surface on a runaway course, researchers say. According to scientists, these findings could potentially help explain how this cold, dry world might have once sustained liquid water and conditions potentially friendly for life. It would have been an explosion with an energy on the order of 10^26 joules, or 100 billion megatons of TNT. Altogether, scientists had calculated these giant collisions would have raised surface temperatures on Mars by hundreds of degrees. Images like this from the High Resolution Imaging Science Experiment (HiRISE) camera on NASA's Mars Reconnaissance Orbiter show portions of the Martian surface in unprecedented detail. This one shows many channels from 1 meter to 10 meters (approximately 3 feet to 33 feet) wide on a scarp in the Hellas impact basin. On Earth we would call these gullies. Some larger channels on Mars that are sometimes called gullies are big enough to be called ravines on Earth. Now these researchers find this heating might not have been fleeting. 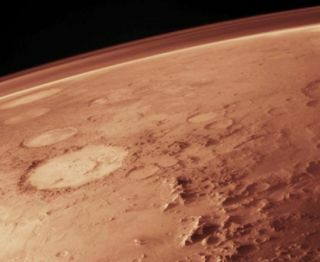 Instead, the warming might have gone on a runaway course, pushing Mars into a long-term stable warm state. The idea of runaway warming is most commonly associated with Venus. Scientists think that planet's close proximity to the sun heated its water, causing it to build up in Venus' atmosphere as steam. Water is a greenhouse gas, trapping heat from the sun that would have vaporized still more water, leading to a runaway greenhouse effect that apparently boiled all the oceans off Venus. Ultraviolet light would have then eventually split this atmospheric water into hydrogen and oxygen. The hydrogen escaped into space, the oxygen became trapped in the rocks of the planet, and the end-result was a bone-dry Venus. The researchers note the many giant impacts Mars experienced might have heated the planet enough to send vast amounts of the greenhouse gases water and carbon dioxide into the air. Their computer models suggest that there might have been enough of these gases in the Martian atmosphere to trigger a long-lasting runaway greenhouse effect. The impact that created the Argyre basin might have by itself been large enough to trigger such a chain reaction. Other impacts that might have pushed Mars toward a runaway greenhouse include the ones that created the Isidis and Hellas basins. "Any terrestrial planet, including Venus, the Earth, or even exoplanets, may have experienced a temporary or permanent runaway greenhouse climate caused by impacts," researcher Teresa Segura, a planetary scientist at the commercial satellite firm Space Systems/Loral in Palo Alto, Calif., told Astrobiology Magazine. It is possible that any impacting comets might have delivered even more greenhouses gases into the atmosphere once they vaporized. Still, "the kinetic energy is of most importance," Segura said. The researchers do note that during the runaway greenhouse phase, Mars would actually have been too warm for liquid water to last on its surface. Still, this heat would eventually subside — ultraviolet light would have caused the Martian atmosphere to lose its water just as Venus did, forcing the Red Planet to cool. After runaway greenhouse conditions collapsed but before Mars became too cold for liquid water on its surface, the planet might have remained wet for a long time, possessing "a prolonged hydrological cycle with rainfall and valley networks as well as surface lakes," Segura said. It remains uncertain just how long either this runaway state or any wet period afterward might have lasted, but previous research suggests the warm climate may have lasted for at least centuries, she noted. Future research could analyze the effects cosmic impacts might have on the climates of Venus, exoplanets and Earth. Although impacts might very well be capable of causing a runaway greenhouse effect now, "the size of the impact required is much larger than that we need to worry about today," Segura said. That is to say, if our planet was hit by an impact large enough to create the Argyre basin, there probably wouldn't be anyone on Earth left to worry about any of the collision's potential effects on climate. Segura and her colleagues Christopher McKay and Owen Toon detailed their findings online May 2 in the journal Icarus.